Popcorn is great at the movies, an amusement park or the carnival. It's not so great on your ceiling, however. And if your home happens to be one of the many with this unnecessary and unsightly addition, then you know just how much of a pain it can be. Not only are popcorn ceilings dated, their bumpy surface traps dirt and dust making it harder to clean. We're not sure who thought this was a good idea, but, we can assure you that taking these ugly ceilings down and replacing them is a lot easier than you realize. Don't believe us? Check out these three simple methods that will get your ceilings looking smooth, bright and cleaner than ever before. 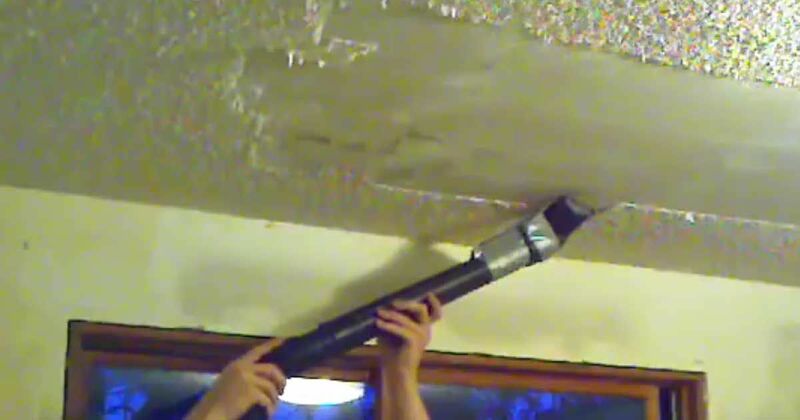 DIY Network highlighted the most popular method to removing these ugly ceilings -- a little bit of water. That's right, after all this time it just took a spraying of warm water to loosen this stuff up and scrape it down. But, this method does get messy. Be sure to move out any furniture and cover the floors with tarps so you don't damage the floors or carpets. This method is pretty close to genius. Instead of using soaking the unsightly popcorn then scraping it into a mess on your floor, Youtuber Aaron Rollins simply tapped a spackle knife to the end of his shop-vac so that when he scrapes it across the ceiling it goes directly into the vacuum tube. Check out the video above for the full tutorial. Like we mentioned at the beginning, lead paint and asbestos are major issues you need to look into before starting this project. If you find out there is asbestos or lead paint, or you're fairly certain it is there and want to avoid it, This Old House suggests drywalling right over the hideous popcorn. They suggest using ceiling-grade gypsum which is nice and light. Then you just have to spackle the seams and it should look brand new. Don't forget to share this article with your friends on Facebook, Twitter, and Pinterest!